President Lincoln Douglas Debate IL - Abraham Lincoln - Presidents and Political - Vintage Postcards | VintagePostcards.com: vintage, old, antique postcards for collectors. "1858-1908 Alton, Illinois. 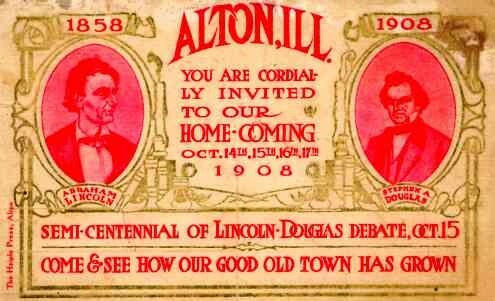 You Are Cordially Invited To Our Home Coming October, 1908, Semi-Centennial Of Lincoln-Douglas Debate." Used, stamp removed, thin on back.